- Painted toenails make one (me) feel like a "real" person... even in sweatpants and messy hair. - I'm a terrible gardner. This just isn't going to change. No matter how many pretty flowers and potted plants I purchase. - Little Man has a special look he whips out just to melt my heart. He doesn't have to use this look often, but when he does, it works every time. Even if he's defiantly tossing banana slices from his plate to the floor. - I'm going to lay off the rabid rental hunt. It's driving me crazy, and until I'm ready to put my money where my mouth is, it's a futile obsession. 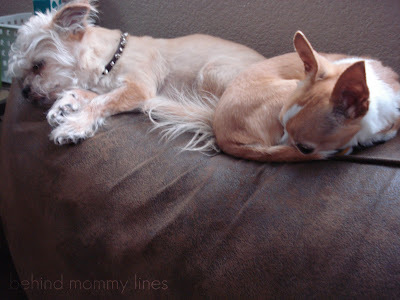 - My girls have a secret stash of food under the floorboards... and that is why they eat two tiny bites of the food I make for them. I've got to find that stealthy cache- asap. -If the big one pees in the dump part of Little Man's dump truck one more time... he's finding a new home. You interested? - A silky matching pair of pajamas makes the morning 100% better. I'm never going back to my ragged cartoon pants and stained oversized tee. - It is physically impossible for the girls to be anything less than ear piercing and ultrasonic in pitch. - I will get very little done today. It's windy outside, and I don't do wind. That, and Squirt is still paralyzed with fear about "blowing away." Given she is still only 28 lbs. I can't blame her. - Staying in pajamas for the entire day shall be today's goal. I'm with ya on the silky pj's...nothing more comfy and I hate the wind too!! Fun to hear updates on your cute kids. Love your blog.